Special thanks to David Van Tassel, Staff Director of the Inter Agency Working Group, and John Taylor, archivist at the National Archives, for their assistance in navigating the CIA names files. Washington D.C., March 24, 2005 - The CIA was surprised by Israeli agents' capture of Nazi war criminal Adolf Eichmann in Argentina in 1960, and a subsequent CIA file review uncovered extensive ties between Eichmann and men who served as CIA assets and allies (like Franz Alfred Six and Otto Von Bolschwing), according to the CIA's three-volume Directorate of Operations file and their Directorate of Intelligence file on Eichmann, posted today by the National Security Archive at George Washington University. 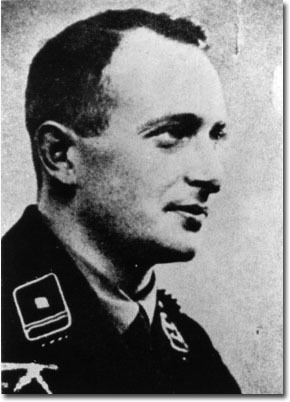 Obersturmbannführer (Lt. Col.) Eichmann was originally a member of the SD (Sicherheitsdienst or Security Service), and went on to head Gestapo Section IV B4 (responsible for Jewish affairs) where he helped plan and implement the Holocaust. Eichmann was captured at the end of World War II by allied forces, but managed to escape the internment camp where he was confined in 1946. On May 2, 1960, Eichmann was apprehended by Israeli secret agents in Argentina, where he had been hiding under an assumed name, and smuggled back to Israel to stand trial for his crimes. After a highly publicized trial in 1961, Eichmann was sentenced to death and executed in 1962. The CIA file on Eichmann includes a number of revelations, including the lack of American intelligence on Eichmann's whereabouts before his capture, as well as a lack of intelligence on the Israeli operation to find and bring him to justice. The documents contained in this names file reveal CIA surprise at the initial capture of Eichmann in Argentina by Israeli agents. After news of the capture surfaced, the Director of the CIA immediately requested that CIA operatives with contacts in the Israeli intelligence service, gather "all possible details" on the operation. In one such interchange between a CIA agent and his Israeli counterpart about the Eichmann capture, the undisclosed CIA agent notes "I opened the conversation by asking him to transmit to [excised] and [excised] congratulations on the final accomplishment of what appeared to be a magnificent job and our desire to help in any way possible. Although we felt sure that [excised] had much more information on the men than we have, nevertheless, there may be captured Nazi war documents in which he might be interested." [Vol 1, document 49]. As one of three non-government members of the IWG appointed by Clinton, I have had direct experience with the difficulties of getting public release of records stamped "secret." So far, over 8 million pages of previously classified documents have been released. National security has not been jeopardized. Yet, but for the Act, these records would still be secret. Recently, despite the fact that relevant records are in some cases more than 50 years old, the CIA balked at full compliance, causing a delay of more than a year in the IWG's work. Finally, to break the impasse, the IWG had to seek Congressional intervention. The Act's authors, Sen. Mike DeWine and Rep. Carolyn Maloney, rejected the CIA's argument for withholding important documents in a meeting with IWG and CIA officials. Ultimately, the CIA abandoned its opposition and has promised to comply. This is great news. The C.I.A. will now follow the rule of law, and the disclosure will be crucial to the American public. I am very pleased. The IWG was established in January 11, 1999 and has overseen the declassification of about eight million pages of documents from multiple government agencies. Its original mandate was to expire at the end of March 2005, but on March 14, 2005, the U.S. House of Representatives voted to extend the deadline until March 2007 (a recommendation already passed by the Senate on February 16, 2005.) The IWG is interested in obtaining further information on any war criminals or suspected war criminals, especially those with whom the CIA had relationships, including information on the nature of the relationship and what the individual did for the agency. The nature of the new requests for information come from leads found in documents already released by the CIA and other agencies, as well as research done by the IWG historians. The documents annexed in the CIA names file posted today by the Archive span from the time of the war to the mid 1990s, and include both captured German documents and documents from various U.S. government agencies. As with all the CIA names and subject files, only copies of the documents were released to NARA, not the original documents. The names and subject files are artificial creations made by the CIA for the purpose of obeying the Nazi War Crimes Disclosure Act, while disguising how the CIA organizes its own files. For a more detailed description of the Names Files and the history of their compilation refer to this notice. Attempts by the CIA in the wake of Eichmann's capture to gather more information on names connected to Eichmann (Document 7 Vol 2). One CIA memo reveals the fear that incriminating information on such individuals - including Franz Alfred Six (an SS Lt. Col and Eichman's boss from 1936-39, and a section leader in the post-war Gehlen intelligence organization - would make them vulnerable to Soviet recruitment (Document 23 Vol 2). An August 24, 1962 walk-in of a man claiming to be Eichmann's son, who offered to help capture Josef Mengele in exchange for a changed identity (Document 72 Vol 3). The National Security Archive is one of the most active non-profit FOIA requesters and won the prestigious George Polk Award in April 2000 for "piercing self-serving veils of government secrecy." Note: Many of the following documents are in PDF format. NOTE: The following CIA names file on Adolf Eichman has been split into separate pdf files for each separate document, and they are organized exactly as they appear in the CIA names file collection at NARA II, College Park. Please note that any repetition of multiple documents and the use of large sections of news clippings were kept intact to show the exact nature of the CIA release. The IWG website has an html index of the names files here and available here is a complete pdf version of the finding aid. Adolf Eichmann Name File. Record Group 263. CIA Names Files. Boxes 14-15. National Archives. Document 1: "European Parliament Resolution on Human Rights in Syria," September 19, 1991. U.S. Embassy (Brussels) Cable. 3pp. Document 2: "Senator Kennedy Letter to Ambassador on Nazi War Criminal Alois Brunner," July 3, 1991. U.S. Embassy (Damascus) Cable. 2pp. Document 3: "GOY Press Statement on Waldheim; Reaction to Commission Report," February 9, 1988. U.S. Embassy (Belgrade) Cable. 7pp. Document 4: "Nazi War Criminal Alois Brunner's Presence in Damascus Hits the Papers Again," November 5, 1987. Department of State Cable. 4pp. Document 5: "Report That Wallenberg Is Still Alive," December 1, 1986. U.S. Embassy (Tel Aviv) Cable. 2pp. Document 6: "US Archives on War Crimes - April 10 Update on Waldheim and Related Cases," April 11, 1986. US Mission to the UN (New York) Cable. 2pp. Document 7: "Alois Brunner - Dead or Alive?" January 6, 1993. U.S. Embassy (Damascus) Cable. 3 pp. Document 8: " 'Nazi Gold' in Austria: A New (Old) Story," December 2, 1996. U.S. Embassy (Vienna) Cable. 2pp. Document 9: "SAO Request - Possible 212(A)(33) Ineligibility," April 16, 1993. U.S. Consulate (Frankfurt) Cable. 6pp. Document 10: "Media Reaction: Vice President Quayle in the Ghanaian Press," December 13, 1989. U.S. Embassy (Accra) Cable. 5pp. Document 11: "SAO Request - NIV," July 3, 1989. Department of State Cable. 3pp. Document 12: "212 (A)(33) Case," July 12, 1988. Department of State Cable. 6pp. Document 13: "Austrian Press Summary No. 126/88, For 07/11/88," July 11, 1988. U.S. Embassy (Vienna) Cable. 3pp. Document 14: "German Media Reaction Report," February 27, 1986. U.S. Embassy (Bonn) Cable. 10pp. Document 15: "Austrian Press Summary No. 53/83, for 3/18/83," March 18, 1983. U.S. Embassy (Vienna) Cable. 3pp. Document 16: "Austrian Press Summary No. 53/83, for 3/18/83," March 18, 1983. U.S. Embassy (Vienna) Cable. 3pp. Document 1: [Copy of Captured German Document], October 8, 1941. From Berlin. 1pg. Document 2: [Copy of Captured German Document]. October 15, 1941. 1pg. Document 3: ['Schnellbrief' and other Captured German Documents]. From Berlin. January 31, 1942 (and other dates). 42 pp. Document 4: "Eichmann, Adolf/Lt.Col," June 30, 1944. Document Transfer. 1pg. Document 5: [Captured SS Documents and Hand-Written Letter Signed by Eichmann], September 21, 1944 and other dates. 26 pages. Document 6: "SS Obersturmbannführer Adolf Eichmann - Chief of Group IV B 4 of the Reichssicherheitshauptamt, the So-Called Judenreferat," June 17, 1946. Report from Berlin. 3pp. Document 7: "Eichmann, Adolf," July 11, 1945. Subject File Extract. 2pp. Document 8: "Security Arrest Report," February 13, 1947. CIC Army Report. 1 pg. Document 9: "SD member Theodore Daennecker, Age 32," December 11, 1945. Third US Army Squad Truscott Message. 33pp. Document 10: "Wislizeny, Dieter," August 1, 1946. CIC Arrest Report. 16pp. Document 11: "Eichmann, Adolf," November 19, 1946. CIC Memorandum. 2pp. Document 12: "Interrogation to Determine Whereabouts of Eichmann, Otto Adolf," December 16, 1946. 2pp. Document 13: "Daennecker, Theo," December 31, 1946. CIC Memorandum. 12pp. Document 14: "Interrogation of Parents and Brother of SS Obersturmbannführer Otto Adolf Eichmann," January 29, 1947. CIC Memorandum. 4pp. Document 15: [Illegible German-Language Document]. February 10, 1947. 1pg. Document 16: "Cirzick, Ernst, Allgemeine SS Obersturmbannführer in the SD and Suspected War Criminal, Interrogation and Internment," February 12, 1947. CIC Memorandum. 7pp. Document 17: "Burger, Anton [illegible] Interrogation," March 9, 1947. CIC Memorandum 8pp. Document 18: "Cirzick, Ernst," January 16, 1948. US Army Status Report. 6pp. Document 19: "Adolf Karl Eichmann, Espionage," September 15, 1948. Federal Bureau of Investigation Memorandum. 1pg. Document 20: "Einstellung der Auslande zur Judenfragen - Date 1939-1944," November 24, 1950. Foreign Office/State Department, German War Documents Project. 41pp. Document 21: [Kurt Ponger Information on Adolf Eichmann] May 1953. 1pg. Document 22: "Telford Taylor," October 8, 1953. 6pp. Document 23: [Eichmann Rumors en route to Damascus] October 20, 1953. CIA Message. 1pg. Document 24: [Enquiries Negative] October 25, 1953. CIA Message. 1pg. Document 25: Repeat of Document 24. Document 26: Repeat of Document 24. Document 27: Repeat of Document 24. Document 28: Repeat of Document 24. Document 29: [No Trace of Eichmann] October 27, 1953. CIA Message. 1 pg. Document 30: [No Traces Yet] October 27, 1953. CIA Message. 1pg. Document 31: Repeat of Document 30. Document 32: [No Evidence of Eichmann in Egypt] October 27, 1953. CIA Message. 1pg. Document 33: "Eichmann, Karl," October 29, 1958. Routing Slip. 1pg. Document 34: "Traces on Karl Heinz Eichmann," November 23, 1953. Chief of Mission Message. 1pg. Document 35: Repeat of Document 32. Document 36: "Karl Eichmann," December 22, 1953. Dispatch. 2pp. Document 37: [Letter from Simon Weisenthal to Dr. Goldmann] March 30, 1954. 4pp. Document 39: "Karl Eichmann," April 6, 1954. Acting Chief Dispatch. 1pg. Document 40: "Miscellaneous Travellers," January 4, 1957. Operational and Source Cover Sheet. 1pg. Document 41: "Near Eastern Connections," March 19, 1958. 4pp. Document 43: "Operation Crypt - Rolf Delius," March 19, 1958. Chief of Station Dispatch. 4pp. Document 44: "Adolf Karl Eichmann," September 30, 1959. Federal Bureau of Investigation. 2pp. Document 45: "Eichmann, Adolf - SS Colonel," May 24, 1960. 3pp. Document 46: "Israel May Ask Death For Former High Nazi [and other press clips]," May 24, 1960. [Various news sources] 5pp. Document 47: "Capture of Adolf Eichmann," [illegible date]. 2pp. Document 48: [Reported Capture of Eichmann] May 24, 1960. CIA Cable. 2 pp. Document 49: "Meeting with [excised]," May 26, 1960. CIA Memorandum for the Record. 2pp. Document 50: "Capture of Adolf Eichmann," May 27, 1960. Air Pouch. 2pp. Document 51: "Tuvia Friedman," May 27, 1960. Press Translation. 1pg. Document 52: "Eichmann, Adolph - Eichmann Documents," May 31, 1960. FBIS Extract. 1pg. Document 53: "Propaganda Highlights in the Eichmann Case [To be attached to 28 March Memo to the Director - Eichmann Case]," March 28, 1961. Press Summaries. 7pp. Document 54: "Adolf Eichmann," [illegible date] CIA memorandum. 4pp. Document 55: "World Tribunal Is Urged for Nazi," June 1, 1960. New York Times Article. 1pg. Document 56: "Luncheon Meeting with [excised] at Rio Gauche [excised] 1960," June 1, 1960. Memorandum for the Record Extract. 1pg. Document 57: [Request for Eichmann Fingerprints], June 1960. CIA Cable. 1pg. Document 58: [No Fingerprints of Eichmann Found] June 3, 1960. CIA Cable. 1pg. Document 59: "NSDAP Master File, SS Officers File, RuSHA and Misc. File: Eichmann, Adolf," May 26, 1960. Berlin Document Center Coversheet. 1pg. Document 60: "Press Articles on Adolf Eichmann," June 3, 1960. Dispatch. 2pp. Document 61: [Send Congratulations on Eichmann Capture and Elicit More Details on Operation] June 3, 1960. CIA Cable. 2pp. Document 62: "Capture of Adolf Eichmann," June 6, 1960. Air Pouch. 2pp. Document 63: [Franz Alfred Six and Other Eichmann Agents] illegible date. CIA Cable. 3pp. Document 64: [Newsweek Article on Eichmann-Clipping and Memos Analyzing Eichmann Capture] June 6, 1960. 11pp. Document 65: "SD in the Slovakei," [illegible date]. US Army Report. 2pp. Document 66: "Adolf Eichmann Case," August 15, 1960. Air Pouch. 1pg. Document 67: [Existence of Eichmann Memoirs] September 13, 1960. CIA Cable. 2pp. Document 68: "Adolf Eichmann Case," December 14, 1960. Air Pouch. 2pp. Document 71: [International Press Sightings of Adolf Eichmann] circa 1955. 6pp. Document 72: "Meine Flucht - Adolf Eichmann," undated. Manuscript. 39pp. Document 73: "Referat D II," [illegible date]. German Language Document. 1pg. Document 1: "Adolf Eichmann," September 17, 1937. SS Personnel Record. 2pp. Document 2: "Beurteilung," November 9, 1937. Captured German Document. 2pp. Document 3: [Evacuation of Budapest Jews] November 13, 1944. Translated German Telegram. 2pp. Document 4: "Appeal to DCI by Mr. Adolph Berle and Rabbi Kalmanowitz for CIA Action to "deal" with Nazi War Criminal Karl Eichmann," October 20, 1953. CIA Memorandum. 1pg. Document 5: "Israel Seeks Eichmann Case Compromise with Argentina," June 13, 1960. Washington Post Article. 1pg. Document 6: "Rockefeller Has Two Big Hurdles," June 13, 1960. Washington Post Article. 1pg. Document 7: [Request for BDC Papers on SS Officers] June 15, 1960. CIA Cable. 3pp. Document 8: "Meeting with [excised] on 15 June 1960," June 15, 1960. Extract of Memorandum for the Record. 1pg. Document 10: "Eichmann Case," June 15, 1960. State Department Cable and attached other cables. 14pp. Document 11: [Heavily Excised, Formerly Withdrawn] June 15, 1960. FBI Report. 3pp. Document 12: "Sidelights of the Eichmann Case," May 1960. 4pp. Document 13: "Adolf Eichmann," May 15, 1960. CIA Memorandum. 3pp. Document 14: "Selected Translations on the Eichmann Case from German Magazine," June 15, 1960. 23pp. Document 15: "Latin American Official on [illegible] Visit," June 16, 1960. U.S. Embassy (Paris) Cable. 2pp. Document 16: [French Position on Jerusalem and Eichmann Affair] June 16, 1960. State Department Cable. 4pp. Document 17: "Adolf Eichmann Case," June 16, 1960. Air Pouch. 1 pg. Document 18: [Illegible] June 16, 1960. CIA Cable. 1 pg. Document 19: "Argentinians Helped on Eichmann," June 17, 1960. Washington Post Article. 1pg. Document 21: "Adolf Eichmann," June 17, 1960. CIA Memorandum. 2pp. Document 22: "Eichmann Case [negotiations with Argentina]," June 17, 1960. Department of State Cable. [Other Cables Attached] 9 pp. Document 24: [Ben Gurion not in Rome] June 18, 1960. U.S. Embassy (Rome) Cable. 1pg. Document 25: [French Position on Israel-Argentina Conflict over Eichmann] June 18, 1960. U.S. Embassy (Paris) Cable. 2pp. Document 26: [Proposed Meeting Between Frondizi and Ben Gurion] June 19, 1960. 2pp. Document 27: [Israeli Position on Negotiation to End Tension with Argentina over Eichmann Affair] June 19, 1960. U.S. Embassy (Tel Aviv) Cable. 1pg. Document 28: [French and German Position on Eichmann Affair] June 19, 1960. U.S. Embassy (Paris) Cable. 1pg. Document 29: "Eichmann Case," June 20, 1960. Department of State Cable. 2 pp. Document 30: [Israeli Ambassador Herman on Eichmann Case] June 20, 1960. U.S. Mission to the U.N. (New York) Cable. 1pg. Document 31: [Possible Meeting with Ben-Gurion and Frondizi] June 19, 1960. U.S. Embassy (Paris) Cable. 2pp. Document 32: [Instructions on Argentine UN Resolution] June 20, 1960. Department of State Cable. 1pg. Document 33: [French Position on Jerusalem] June 20, 1960. U.S. Embassy (Jerusalem) Cable. 1pg. Document 34: [More on Possible Meeting Between Frondizi and Ben-Gurion] June 20, 1960. U.S. Embassy (Paris) Cable. 2pp. Document 35: "Eichmann Case," June 20, 1960. U.S. Mission to U.N. (New York) Cable. 3pp. Document 36: "Eichmann Case," June 20, 1960. U.S. Mission to U.N (New York) Cable. 2pp. Document 37: "Eichmann Case," June 20, 1960. U.S. Mission to U.N. (New York) Cable. 4pp. Document 38: [Suggestion on How to Resolve Argentine-Israeli Conflict over Eichmann, and Analysis of Future Trial - Clippings and Other Documents Attached] June 20, 1960. 8pp. Document 39: [Arab Editor Condemns Israeli Capture of Eichmann in Argentina] June 21, 1960. U.S. Embassy (Cairo) Cable. 1pg. Document 40: "Forwarding of BDC Check Results," June 21, 1960. Dispatch. 2pp. Document 41: "Eichmann Case," June 21, 1960. U.S. Mission to U.N. (New York) Cable. 3pp. Document 42: [Scheduled Meeting Between Ben Gurion and Frondizi] June 21, 1960. U.S. Embassy (Paris) Cable. 1pg. Document 43: "Eichmann Case," June 21, 1960. U.S. Mission to U.N. (New York) Cable. 2pp. Document 44: "Eichmann Case, Wellner telecom," June 21, 1960. U.S. Embassy (Rome) Cable. 1pg. Document 45: "Eichmann, Adolf," June 21, 1960. Telephone Request for Name Check. 1pg. Document 46: "The Eichmann Affair: The Arrest and Immediate Aftermath," June 21, 1960. U.S. Embassy (Tel Aviv) Despatch. 13pp. Document 47: "Eichmann Case," June 22, 1960. U.S. Mission to U.N. (New York) Cable. 7pp. Document 48: "Eichmann Case," June 22, 1960. U.S. Mission to U.N. (New York) Cable. 2pp. Document 49: [Frondizi/Ben-Gurion Meeting] June 21, 1960. U.S. Embassy (Paris) Cable. 1pg. Document 50: "Eichmann Case," June 22, 1960. U.S. Mission to U.N. (New York) Cable. 1pg. Document 51: "Eichmann Case," June 22, 1960. U.S. Embassy (Rome) Cable. 1pg. Document 52: [BDC Name Checks] June 22, 1960. CIA Cable. 1pg. Document 53: "Alleged 'Captor' Tells of Seizing Eichmann," June 23, 1960. Washington Post Article. 1pg. Document 54: [Tracing of Six] June 22, 1960. CIA Cable. 1pg. Document 55: "Adolf Eichmann," June 22, 1960. Cover Memorandum. 2pp. Document 56: "Security Council - Eichmann Case," June 23, 1960. U.S. Mission to U.N. Cable. 6pp. Document 57: "Eichmann Case," June 23, 1960. U.S. Embassy (Tel Aviv) Cable. 3pp. Document 58: [Caution on Name Check on Six and Others] June 23, 1960. CIA Cable. 1pg. Document 59: [Letter to Berlin Document Center on ITS Documentation on Eichmann's Policy of Deportation of Jews] June 23, 1960. International Committee of the Red Cross Letter. 1pg. Document 60: "Security Council-Eichmann Case," June 23, 1960. U.S. Mission to U.N. (New York) Cable. 6pp. Document 61: "Extradition Case of Nazi Josef Mengel, Accused of War Crimes," June 24, 1960. U.S. Embassy (Buenos Aires) Despatch. 2pp. Document 62: "Eichmann Case," June 24, 1960. U.S. Embassy (Tel Aviv) Cable. 2pp. Document 63: "Adolf Eichmann Case," June 25, 1960. Air Pouch. 1pg. Document 64: "Ricardo Klement, Request for Fingerpring Analysis of," June 29, 1960. Memorandum. 1pg. Document 65: "Adolf Eichmann," July 1, 1960. Forwarding of Captured German Documents [German Documents Not Included]. 1pg. Document 66: Israel Suggests Apology Is Enough For Eichmann," July 3, 1960. Evening Star Article. 1pg. Document 69: "West German Crackdown on Nazis," July 7, 1960. CIA Current Intelligence Weekly Summary. 1pg. Document 70: [Request to International Tracing Service for Copies of Eichmann Documents on Jewish Deportation] July 12, 1960. Berlin Document Center Letter. 1pg. Document 71: [Request from BDC to ITS on Jewish Deportation] July 16, 1960. CIA Cable. 1pg. Document 72: [Response to Request for Documents on Jewish Deportation Policy of Eichmann] July 16, 1960. International Tracing Service Letter. 1pg. Document 73: "Eichmann, Adolf," July 21, 1960. Memorandum. 4pp. Document 74: "Lord Russell of Liverpool: Eichmann Trial a Finale," July 24, 1960. Jerusalem Post Article. 1pg. Document 75: "Adolf Eichmann," July 25, 1960. Air Pouch. 1pg. Document 76: "Adolf Eichmann," August 5, 1960. Memorandum. 1pg. Document 77: [Eichman Clippings] August 6, 1960. 1pg. Document 78: "DDR Accuses Hans Globke of Nazi Crimes," July 29, 1960. Memorandum. 3pp. Document 79: "Adolf Eichmann, Internal Security - Israel," August 8, 1960. Federal Bureau Investigation Report. 3pp. Document 80: "Luncheon Meeting with [excised]," August 9, 1960. Memorandum for the Record. 2pp. Document 81: "DDR Accuses Hans Globke of Nazi Crimes," August 9, 1960. Memorandum. 1pg. Document 82: "Adolf Eichmann Case," August 16, 1960. Air Pouch. 2pp. Document 83: [Federal Records Center to Give Schuele Access to Captured German Documents] August 17, 1960. CIA Cable. 3pp. Document 84: [Abraham Selinger Requests Visa to Obtain Records for Eichmann Trial] August 18, 1960. CIA Cable. 1pg. Document 85: "Adolf Eichmann Case," August 18, 1960. Air Pouch. 1pg. Document 87: [No Objection to Giving Schuele Copies of Eichmann Documents] August 20, 1960. CIA Cable. Ipg. Document 88: [Life and Eichmann Memoirs] September 20, 1960. CIA Cable. 1pg. Document 89: "Adolf Eichmann," August 20, 1960. Memorandum. 1pg. Document 90: "Documents Concerning Adolf Eichmann," September 6, 1960. Memorandum. 1pg. Document 91: "Zivia Lubetkin," September 12, 1960. Federal Bureau of Investigation Report. 2pp. Document 92: "Officials of the West German Government Examining Captured German Records on Eichmann," September 13, 1960. Memorandum for the Record. 2pp. Document 93: "Adolf Eichmann," September 15, 1960. Memorandum. 1pg. Document 94: [Illegible Clipping] September 1960. Washington Post Article. 1pg. Document 95: [Selling of Eichmann Memoirs] September 16, 1960. CIA Cable. 2pp. Document 96: [Concern over Publication of Eichmann Memoirs] September 17, 1960. CIA Cable. 1 pg. Document 97: "Dr. Robert M. W. Kempner," September 21, 1961. Memorandum for the Record. 1pg. Document 98: "Israel Access to Eichmann Material in Archives," September 29, 1960. Memorandum for the Record. 2pp. Document 99: "Zivia Lubetkin," September 30, 1960. Memorandum. 1pg. Document 100: [Traces on Runge, Erwin Schuele or Hindrichs] October 1960. 1pg. Document 101: [Selinger Announcement to Die Welt on Eichmann Memoirs] October 11, 1960. CIA Cable. 1pg. Document 102: [Argentina-Israel Relations After Eichmann Affair] circa 1960. Reuters News Summary. 1pg. Document 103: "Adolf Eichmann," October 14, 1960. Memorandum. 1pg. Document 104: [Life to Publish Eichmann Memoirs] October 18, 1960. CIA Cable. 1pg. Document 105: [Spiegel Article on Eichmann Memoirs] October 19, 1960. CIA Cable. 1pg. Document 106: "Adolf Eichmann," October 28, 1960. Memorandum. 1pg. Document 107: "Eichmann Trials: Ben-Gurion's Views," November 1, 1960. U.S. Embassy (Tel Aviv) Air Pouch. 5pp. Document 108: "Memorandum of Conversation with [excised]," November 21, 1960. 1pg. Document 109: "Adolf Eichmann," November 25, 1960. Memorandum. 1pg. Document 110: [More on Eichmann Memoirs] November 22, 1960. CIA Cable. 1pg. Document 111: [Counter Propaganda on Eichmann Case] November 29, 1960. CIA Cable. 1pg. Document 112: [Various Appearances of Eichmann Memoirs] December 1, 1960. CIA Cable. 1pg. Document 113: "Boleslaw Piszacki," [illegible date]. Memorandum. 1pg. Document 114: "Eichmann Memoires," December 21, 1960. Memorandum. 1pg. Document 115: "[excised] Involvement with West Germany of Eichmann Case," December 2, 1960. CIA Dispatch. 1pg. Document 116: [Letters from Otto Skorzeny] December 30, 1960. 1pg. Document 117: [Clarification of Otto Skorzeny Involvement in Eichmann Flight] January 4, 1961. CIA Cable. 3pp. Document 118: [German Language Document] illegible date. 2pp. Document 119: [German Language Document] illegible date. 4pp. Document 120: "Eichmann, Adolf," December 1971. Document Extract. 1pg. Document 121: [Illegible Title, and Almost Entirely Illegible Text], illegible date. Department of State Cable. 3pp. Document 123: [German Language Document] illegible date. 3pp. Document 1: [Associations of German Refuges in Damascus] July 25, 1960. Dispatch. 3pp. Document 2: [Controversy of Life Publishing Material After Kichmake Arrest]. September 15, 1960. Munich. CIA Cable. 2pp. Document 3: [Phone Conversation Outline about Eichmann/Tadmor] October 27, 1960. Memorandum. 2pp. Document 4: [More on Life's Possesion of Eichmann Memoirs] November 1, 1960. CIA Cable. 4pp. Document 5: [Recent NYTimes Article Naming German "War Criminals"] November 16, 1960. CIA Cable. 2pp. Document 6: [Permission from Ethiopian Gov. for Observer in Eichmann Trial] January 20, 1961. CIA Cable. 1pg. Document 7: "Beleslaw Piszacki," January 25, 1961. Memorandum. 1pg. Document 8: [Reference to Kastner Before and During Eichmann Trial] January 25, 1961. Memorandum. 2pp. Document 9: "Adolf Eichmann Trial," January 26, 1961. Memorandum. 1pg. Document 10: "Possible Soviet-bloe Role in Adolf Eichmann Case," February 7, 1961. Air Pouch. 2pp. Document 11: [Biographic Brief on Dr. Jur Fritz Bauer] February 7, 1961. Document Extract. 1pg. Document 12: "The Eichmann Trial and Allegations Against Sec. State Dr. Globke," February 7, 1961. U.S. Consulate Frankfurt Despatch. 5pp. Document 13: "(Hessian Attorney General) Fritz Bauer," February 14, 1961. Air Pouch. 1pg. Document 14: [Adolf Eichmann; Dr. Josef Mengele] February 17, 1961. Federal Bureau of Investigation Memorandum. 2pp. Document 15: [Info for Use Against Eichmann] February 18, 1961. CIA Cable. 2pp. Document 16: [Illegible Clipping] February 1961. 2pp. Document 17: [Preparing Study on Soviet Exploitation of Eichmann Case] February 22, 1961. Munich. CIA Cable. 2pp. Document 18: [More on Soviet Study] February 23, 1961. CIA Cable. 3pp. Document 19: "Boleslaw Piasecki aka Piszacki," February 24, 1961. Memorandum. 1pg. Document 20: [Eichmann Case: Eichmann Identified as Clement] Illegible Date. 1pg. Document 21: "Adolf Eichmann Trial," February 27, 1961. Air Pouch. 1pg. Document 22: [Illegible Clipping] Illegible Date. Unknown Doc Type. 1pg. Document 23: [Potential Plan of Skorzeny and ex-Nazis to Murder Eichmann] March 3, 1961. Classified CIA Message. 1pg. Document 24: "Adolf Eichmann Case," March 6, 1961. Air Pouch. 1pg. Document 25: [(Excised) Discusses Major Revelation in Eichmann Trial-More to Come in Future Convos] March 13, 1961. Munich. Classified CIA Message. 1pg. Document 26: "Possible Communist Exploitation of Trial of Adolf Eichmann," March 26, 1961. Munich. Air Pouch. 2pp. Document 27: "Evaluation of Eichmann Documents," March 17, 1961. Memorandum. 2pp. Document 28: "Eichmann Trial," March 24, 1961. CIA Doc. 1pg. Document 29: [A West German has been Appointed Legal Observer in Eichmann Trial] March 28, 1961. CIA Cable. 1pg. Document 30: "The Eichmann Case," March 28, 1961. Memorandum. 6pp. Document 31: "Boleslaw Plasecki aka Piszacki," April 3, 1961. Memorandum. 1pg. Document 32: "Re: Our Telegram 3475 March 20, 1959 and Previous Joseph Elie Kessel," April 4, 1961. US Embassy (Paris) Cable. 1pg. Document 33: "Dr. Friedrich Karl Kaur," April 6, 1961. Memorandum. 3pp. Document 34: [Biographic Brief on Dr. Gorhard Froiherr von Pruesohen] April 13, 1961. US Consulate (Frankfurt) Cable. 1pg. Document 35: [German Refugee Brunner Escaping Punishment for Anti-Jewish Activities] April 26, 1961. CIA Cable. 2pp. Document 36: "Allegations that Eichmann is now a Communist," April 21, 1961. Memorandum. 1pg. Document 37: [Summary of Facts Known about Subject] April 26, 1961. CIA Cable. 1pg. Document 38: [Eichmann's Brother-in-Law a Czech Colonel-In Obscure Military Assignment to Avoid Publicity] Illegible Date. 2pp. Document 39: "Report from Israel," April 1961. The American Jewish Committee Report. 7pp. Document 40: "Allegations that Eichmann is now a Communist," Illegible Date. Memorandum. 2pp. Document 41: [Security of (Subject) when Visiting Ha'am Jerusalem] May 6, 1961. Air Pouch. 5pp. Document 42: [More on Eichmann Being Communist] May 9, 1961. Munich. Classified CIA Message. 2pp. Document 43: [Requesting (Subject) with Advance Notice of Info of Publication w/ Text] May 1961. CIA Cable. 1pg. Document 44: [Testimony Against Eichmann] May 10, 1961. US Embassy (Berlin) Cable. 1pg. Document 45: "Eichmann Trial Visit," May 12, 1961. Dispatch. 1pg. Document 46: "Miscellaneous Notes," May 12, 1961. Document Extract. 1pg. Document 47: ["The People" (London) Hold Rights to Eichmann Memoirs] May 17, 1961. CIA Cable. 1pg. Document 48: "Eichmann Trial Visit; [excised] Relations with [excised]," May 25, 1961. Air Pouch. 2pp. Document 49: "Nicholas Eichmann - Internal Security Israel," May 26, 1961. Federal Bureau of Investigation Report. 1pg. Document 50: [Eichmann Confession on Communism] June 5, 1961. CIA Cable. 2pp. Document 51: [Rejection of Proposal to Take Klaus Eichmann to Israel to Visit Father During Trial] June 12, 1961. CIA Cable. 1pg. Document 53: "Klaus Nicolas Peter Eichmann - Internal Security Eichmann," June 16, 1961. Federal Bureau of Investigation Report. 2pp. Document 54: "Communique of the Communist Party of the U.S. on the Eichmann Trial," June 19, 1961. Memorandum. 1pg. Document 55: "The Eichmann Trial: A Midway Assessment," June 20, 1961. U.S. Embassy (Tel Aviv) Air Pouch. 4pp. Document 56: [Group Protecting Eichmann] June 24, 1961. CIA Cable. 1pg. Document 57: [Argentine Agent Who Protected Eichmann In Fear for Life] June 24, 1961. CIA Cable. 1pg. Document 58: "Klaus Nicolas Peter Eichmann," June 28, 1961. Federal Bureau of Investigation Report. 3pp. Document 59: [Eichmann on Communism] October 17, 1961. CIA Cable. 2pp. Document 60: [Martin Bormann's Presence in Argentina] May 1, 1961. Associated Press Summary. 1pg. Document 61: "General Expansiveness of [excised]," August 24, 1961. Air Pouch. 1pg. Document 62: "Adolf Eichmann - 201-047132," December 28, 1961. CIA Dispatch. 1pg. Document 63: "Simon Wiesenthal," January 26, 1962. Memorandum. 2pp. Document 64: "Dr. Friedrich Kaul," February 12, 1962. Air Pouch. 1pg. Document 65: [Attempted Deportation of Eichmann to Argentina] February 27, 1962. CIA Cable. 1pg. Document 66: [Eichmann Comments on Globke] February 28, 1962. CIA Cable. 2pp. Document 67: [Eichmann Book on Globke] March 7, 1962. CIA Cable. 1pg. Document 68: [Information on Unnamed Austrian Communist] April 3, 1962. Memorandum. 1pg. Document 69: [Interrogator of Eichmann Former Communist] April 4, 1962. Memorandum. 1pg. Document 70: Efforts on Behalf of Adolf Eichmann by Otto Skorzeny," May 7, 1962. CIA Dispatch. 1pg. Document 71: [Yugoslav and Austrian Questioning of Eichmann on Former Nazi War Criminals] May 7, 1962. U.S. Embassy (Tel Aviv) Cable. 1pg. Document 72: "Walk-In of Adolf Eichmann's Son," August 24, 1962. CIA Dispatch. 2pp. Document 73: "Adolf Eichmann Dies on the Gallows; Self-Possessed, Defiant to the End," June 1, 1962. Reuters Article. 2pp. Document 74: "The Talk of the Town," June 20, 1963. New Yorker Article. 1pg. 1. For further reading on the role of the CIA's Counterintelligence (CI) staff in locating documents and their relations with Israeli intelligence, see Timothy Naftali's essay "CIA and Eichmann's Associates," in U.S. Intelligence and the Nazis, (Washington, DC: National Archive Trust Fund Board, 2004), 339. 3. Ibid, 343. The National Security Archive plans to publish the full CIA names file on Otto Von Bolschwing and four other Eichmann associates profiled in Naftali's essay in the coming weeks. 4. Douglas Jehl, "CIA Defers to Congress, Agreeing to Disclose Nazi Records," New York Times, February 7, 2005. 5. Douglas Jehl, "CIA Said to Rebuff Congress on Nazi Files," New York Times, January 30, 2005.